Straight-blade, or non-parabolic plastic lighting louvers are an efficient, economical solution for a variety of lighting and luminous ceiling applications. A longtime industry standard, the open cell design provides a well ordered, architectural appearance, while at the same time permitting free circulation of air for lower operating temperatures, longer ballast life, and improved lamp performance. Conference rooms, commercial and municipal buildings, entries and corridors, perimeter areas and computer rooms. Please call 1.800.880.5483 for price and delivery. Specify dimensions when placing an order. Diffuser Specialist, assumes no responsibility for suitability of these materials in any luminaire or application. Please test for fit and function prior to ordering project quantities. Subject to changes without notice. 1/2” x 1/2” x 1/2” louvers for use in Office, Retail, Commercial and Medical environments. All Plastic Louvers are destaticized before and after fabrication to ensure a high quality product. 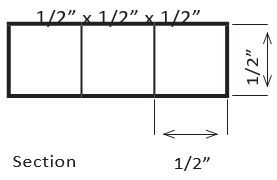 All 1’ x 4’ and 2’ x 2’ louvers MUST be purchased in even multiples. Shipments of oversize louvers are subject to a special packaging charge. Polystyrene louvers shall be injection molded in one-piece 100% white translucent plastic with a uniform wall thickness. 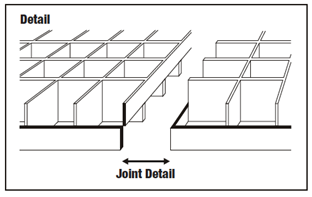 Longitudinal and lateral cell walls are in the same plane and are to form continuous straight-line shielding surfaces in each direction. Plastic louvers incorporate a unique edge interlock trim to facilitate the continuous butting of panels without reversing each louver panel. Styrene louvers are molded in an ultraviolet stabilized material to resist ultraviolet exposure. These styrene louvers meet all industry standards. Interlocking step trim design permits panels to be butted together without a noticeable joint – providing an uninterrupted louver pattern. This jointing method is accomplished without having to reverse louver panels. This drawing is for reference only. Actual part dimensions will vary. Customer is urged to review actual samples to confirm fit and function. All specifications and dimensions are subject to change without notice.